Christopher Pinto is the author/editor of Tiki Lounge Talk, a web-lounge dedicated to remembering the kool stuff from the Atomic Age and beyond, from big band music to cocktails at the Tiki Bar. He's been writing for over 25 years, has had several plays produced, and has won awards for his creative efforts. During the 1990s he was producer/director of a highly successful traveling theater company in the Atlantic City area, StarDust Productions. A lover of all things retro, he enjoys working on his 1953 Chevy Belair Hot Rod, plays jazz tenor sax and clarinet, and is an avid collector of vintage memorabilia. Pinto currently lives in South Florida with his wife Colleen, four birds, two cats, a dog and a Tiki Bar. For more info visit http://stardustmysteries.com. Here's a little more info: Christopher Libero Petroni Pinto was born, raised, and lives in the South...Born In Philadelphia and raised between South Philly and South Jersey, he now lives in South Florida among the palm trees and coconuts. Pinto moved to Fort Lauderdale, Florida in June of 2000, only one week after marrying his wife, Colleen. It was these major changes in his life that led to an avalanche of memories from his youth, including many happy days and night spent on the Wildwood and Ocean City Boardwalks. He decided to write these memories down...and those notes became the basis for his first full-length novel, Murder Behind The Closet Door. Pinto was no newcomer to writing when he began penning MBTCD. He began writing at an early age and won several awards, including a creative writing award from the Philadelphia Bulletin at age twelve. In 1985 he wrote a full-length musical entitled “SwingTime”, including the score, which was adapted for production in his senior year at Egg Harbor Township High School. After college, he began acting in shows at Elaine’s Famous Dinner Theater in Cape May, New Jersey, where he starred in several shows over two years. His time in Cape May (and the adjacent Wildwoods) piqued his interest in the history, architecture and people of the area. Later he would use what he learned and experienced while writing Murder Behind the Closet Door. Pinto started his own traveling theater troupe in 1989, with its first show produced being “A Christmas Carolette”, a spoof of the time-honored A Christmas Carol. This lead to the forming of StarDust Production, Southern New Jersey’s premier traveling dinner theater company through 2000. 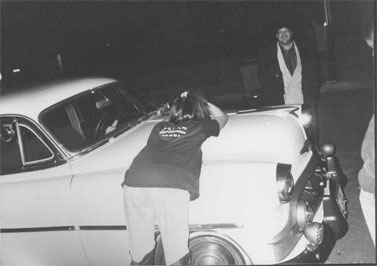 Pinto wrote all the scripts for the shows performed, including “Wildwood Memories”, that was put into production for a run at Neil’s Oyster House in Wildwood…but was never performed, due management changes at the restaurant. Pinto’s shows for StarDust Productions always maintained a retro theme; from jazz music and standards to shows set in the 1930s, ‘40s and ‘50s, every show transported the audience through space and time to a simpler, more swingin’ age. In addition to writing fiction and plays, Pinto has also written for the Atlantic City Press as well as several blogs and flash fictions websites, and is also and award-winning graphic designer and advertising copywriter. He is an accomplished jazz and swing clarinet and saxophone player and a collector of 20th century pop culture junk. In his spare time he restores and customizes vintage cars, including his own custom 1953 Chevy Belair hot rod (named StarDust). Pinto has collected several nick-names over the years, including Chris P, Mack (from his theater days) and Tiki Chris, since he moved to the subtropics. A kool kat that sports vintage fedoras and Raybans, he is committed to keeping the retro life alive. 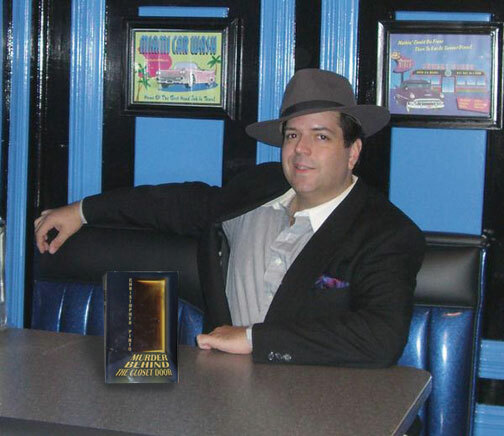 Learn more about Chris Pinto at StarDustMysteries.com. 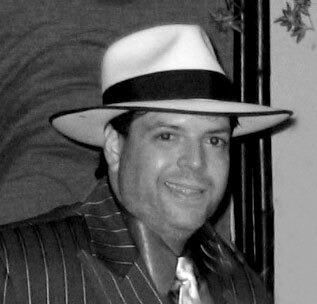 From 1989, Christopher Pinto was writer, actor, director and producer of producer of StarDust Productions Traveling Mystery Theater Company, the highly successful retro murder mystery troupe that performed hundreds of shows in the Atlantic City, Philadelphia, Ocean City, Wildwood and Cape May areas from 1989 to 2000. Pinto wrote all original scripts for all of the shows. Who Shot The Piano Player?! - Interactive Murder Mystery dinner show/musical, set in a 1960's supper club. Radio's Golden Age featuring The Mysterious Presto! - Full-length, 1930's style radio program including commercials and music breaks. Performed live. Yukon Jack's Hidden Treasure - Interactive Murder Mystery dinner show/musical, set in an 1840's Saloon. A Phaeton Full of Gangsters - Interactive Murder Mystery dinner show/musical, set in a 1920's Speakeasy. Lefty's Hideaway - Interactive Murder Mystery dinner show/musical, set in a 1920's Speakeasy. SwingTime - Full-length musical comedy drama, time-travel & big band theme. Set in 1985 and 1941. That Party Was Murder - Fourth-wall paranormal murder mystery stage play set in 1957. Adventures in Automotive Advertising (Contributor) Trends in advertising and the auto industry.